8 VISIT RENTONHISTORY.ORG OR CALL 425.255.2330 235 Mill Ave. S. Renton, WA 98057 425-255-2330 www.rentonhistory.org One block south of the Renton Library Museum Hours Tuesday–Saturday, 10:00 am–4:00 pm Admission Fees Programs are free with the price of admission: Adults: $5 Students/Children: $2 Children 8 and younger: free RHM Members always free Free Admission on the first Wednesday and the third Saturday of the month. Tours The Renton History Museum offers guided tours for all ages by one month advance appointment. Tours cost $40 for groups of eight or fewer and $5 per person for groups larger than ten (even on free admission days). Chap - erones for student or elder groups are free and are highly encouraged. To reser ve a tour, please contact Public Engagement Coordinator Kate Dugdale at kdugdale@rentonwa.gov or 425-255-2330. Get to know Renton's past, present, and future at the Renton History Museum—see our new exhibits, take a tour, or research your Renton family tree. NEW EXHIBIT Hero's Feast: Finding Community through Dungeons and Dragons May 7–October 19, 2019 Learn about the history and impact of Dun- geons & Dragons in Renton. Featuring stories and artifacts, the exhibit will explore the community surrounding the most popular role-play game in history. Whether you've played or not, step into a world of creativity, storytelling, and problem-solving. EVENTS COMING UP! Civil Conversation in an Angry Age April 23, 6:00–7:00pm How do we communicate with each other about complicated topics in a meaningful and productive way? Philosopher David E. Smith explores the answer to this question by looking at the root causes of both civility and incivility. Courtesy of Humanities Washington. Pacific Coast, Seattle's Own Railroad, by Kurt Armbruster May 16, 6:00–7:00pm Join author Kurt Armbruster for a discussion of his latest book, Pacific Coast, Seattle's Own Railroad. After Seattle was passed up for the terminus of the Northern Pacific Railroad, Seattle citizens decided to build their own. This book tells the story of building one of the West's most significant railroads. 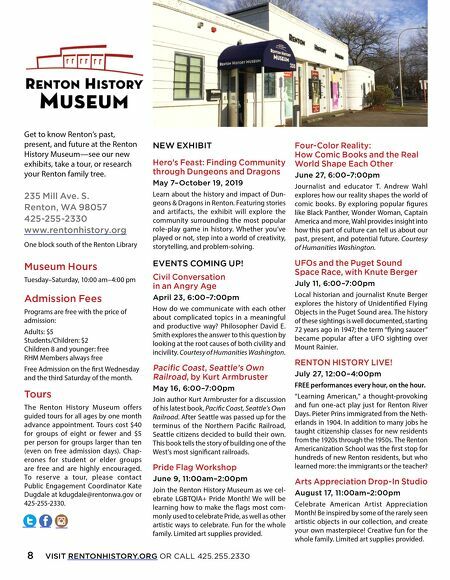 Pride Flag Workshop June 9, 11:00am–2:00pm Join the Renton History Museum as we cel- ebrate LGBTQIA+ Pride Month! We will be learning how to make the flags most com- monly used to celebrate Pride, as well as other artistic ways to celebrate. Fun for the whole family. Limited art supplies provided. Four-Color Reality: How Comic Books and the Real World Shape Each Other June 27, 6:00–7:00pm Journalist and educator T. Andrew Wahl explores how our reality shapes the world of comic books. By exploring popular figures like Black Panther, Wonder Woman, Captain America and more, Wahl provides insight into how this part of culture can tell us about our past, present, and potential future. Courtesy of Humanities Washington. UFOs and the Puget Sound Space Race, with Knute Berger July 11, 6:00–7:00pm Local historian and journalist Knute Berger explores the history of Unidentified Flying Objects in the Puget Sound area. The history of these sightings is well documented, starting 72 years ago in 1947; the term "flying saucer" became popular after a UFO sighting over Mount Rainier. 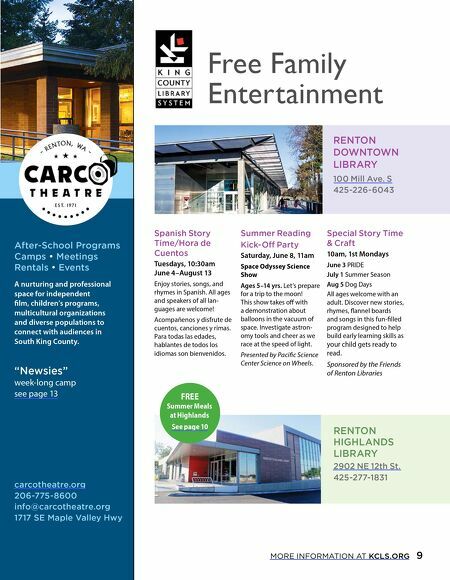 RENTON HISTORY LIVE! July 27, 12:00–4:00pm FREE performances every hour, on the hour. "Learning American," a thought-provoking and fun one-act play just for Renton River Days. Pieter Prins immigrated from the Neth- erlands in 1904. In addition to many jobs he taught citizenship classes for new residents from the 1920s through the 1950s. The Renton Americanization School was the first stop for hundreds of new Renton residents, but who learned more: the immigrants or the teacher? Arts Appreciation Drop-In Studio August 17, 11:00am–2:00pm Celebrate American Artist Appreciation Month! Be inspired by some of the rarely seen artistic objects in our collection, and create your own masterpiece! Creative fun for the whole family. Limited art supplies provided.